The recent mass shooting at Marjory Stoneman Douglas High school in Parkland, Florida, has reignited a national debate about guns in America. In particular, as the conversation has focused on how to keep children safe in schools, the idea of arming some teachers has garnered attention. A 2017 Pew Research Center survey found that more than half of U.S. adults (55%) would oppose allowing teachers and officials to carry guns in K-12 schools, including 36% who said they would strongly oppose such a proposal. Still, a sizable minority (45%) said they favored allowing teachers to carry guns in schools. Parents with children younger than 18 in the household were no more or less likely than non-parents to express support for allowing teachers to carry guns in schools: 46% of parents and 44% of non-parents said they would favor it. Instead, opinions divided primarily along party lines and by gun ownership status, with Republicans and those who own guns particularly likely to say they would support allowing teachers to carry guns in schools. About seven-in-ten Republicans and Republican-leaning independents (69%) said they would favor allowing teachers to carry guns in schools. In contrast, just about a quarter of Democrats and those Democratic leaners (26%) shared this view. Similarly, while a majority of gun owners (66%) said they would support this proposal, about a third of non-gun owners (35%) said the same. Among gun owners, support for allowing teachers to carry guns in schools varied considerably between Republicans and Democrats. About eight-in-ten Republican gun owners (81%) said they favored such a proposal, with about half (48%) saying they strongly favored it. 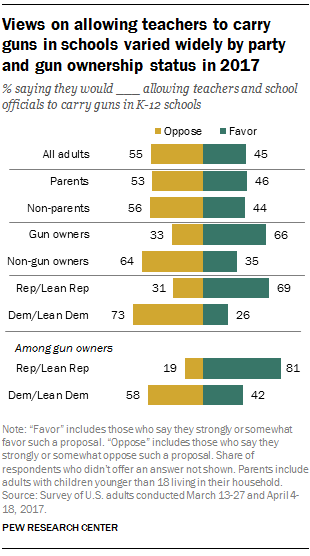 In contrast, about six-in-ten Democratic gun owners (58%) said they opposed allowing teachers to carry in schools, with 39% expressing strong opposition to this idea. The survey also asked about other proposals to expand or restrict gun rights. 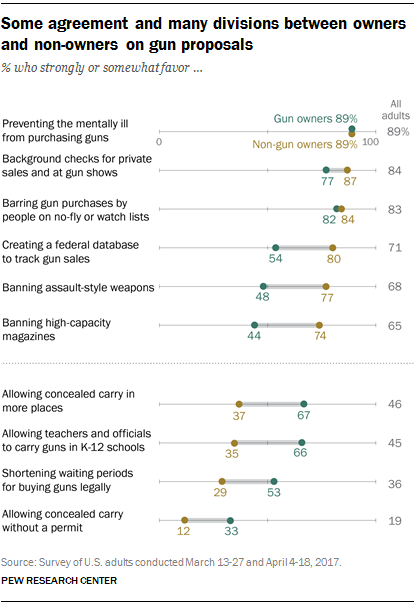 It found broad public support for preventing people with mental illnesses from purchasing guns (89% said they favored it); requiring background checks for private sales and at gun shows (84%); and barring gun purchases by people on no-fly or watch lists (83%). Majorities also expressed support for a federal government database to track all gun sales (71%), banning assault-style weapons (68%) and banning high-capacity magazines that hold more than 10 rounds (65%). Proposals to expand gun rights didn’t garner as much support. Similar to the share of those who supported allowing teachers and officials to carry guns in schools, 46% said they favored allowing people to carry concealed guns in more places. About a third (36%) said they favored shorter waiting periods for buying guns legally, and 19% expressed support for allowing people to carry concealed guns without a permit. There was agreement between gun owners and non-owners and Republicans and Democrats on some proposals – particularly when it came to preventing people with mental illnesses and individuals who are on the federal no-fly or watch lists from buying guns and, to a lesser extent, background checks for private sales and at gun shows. But there were sharp divisions among these groups on other proposals asked about in the survey.